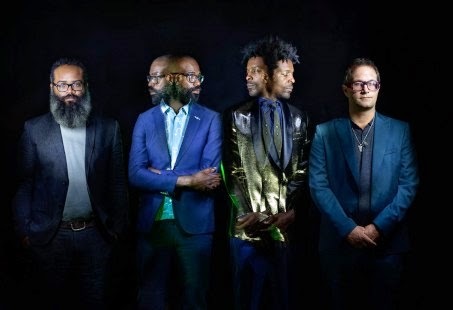 TV on the Radio (TOTR) has released a video for the teaser single "Happy Idiot" starring none other than Paul Reubens, a.k.a. that iconic pop culture character Peewee Herman. Reubens stars as a race care driver cruising past the band in white suits and Karen Gillen (most recently in Gaurdians of the Galaxy) in various female stereotypes offering come hither looks. It's a kicker of a tune, with the usual TOTR charged energy throughout. The group's fifth studio album, Seeds, is due November 18 from Harvest Records. I have experienced this Brooklyn-based group as headliners at two festivals -- Crossing Brooklyn Ferry 2013 and Moogfest 2011. Singer Tunde Adebimpe's smooth tenor floats above the sonic urgency provided by these over-qualified musicians, for an indie rock band at least. Check out our live concert videos and listen up to the "Happy Idiot" below.